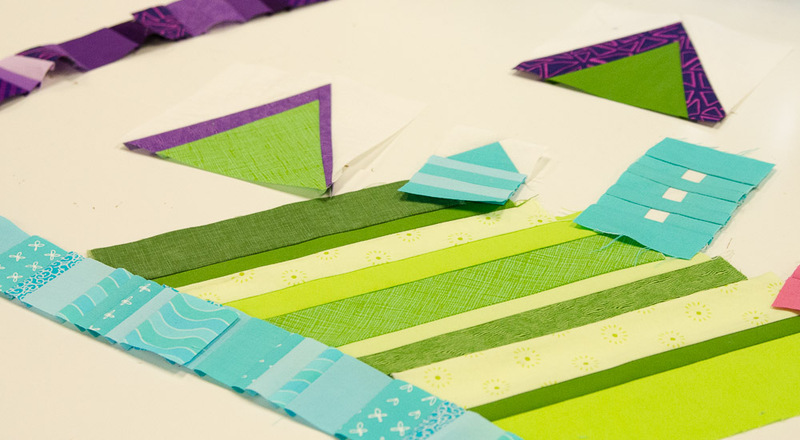 The QuiltCon 2019 Charity Challenge, issued by the Modern Quilt Guild, was to create a twin size quilt that used the color palette featured above and small piecing in the design. Elise Dunbar and Cindy Lammon formed a planning committee and came up with the idea to create a child's quilt that would be similar to a play mat. 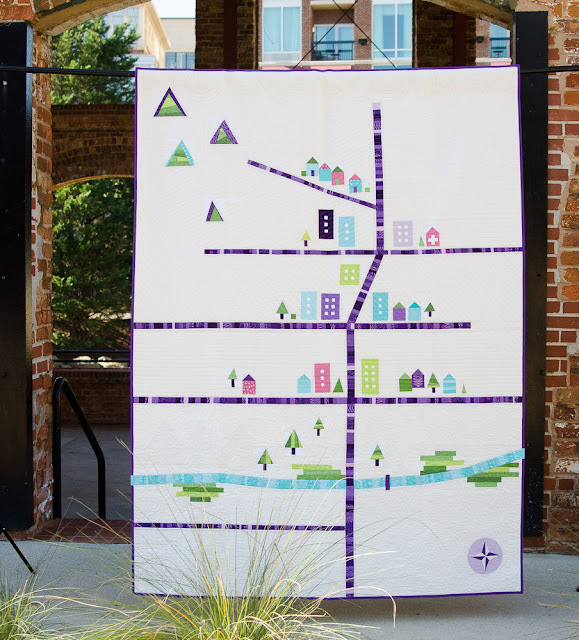 The quilt would be built with roads, buildings, trees, and a river that would be loosely modeled after a map of our city, Greenville, SC. How much fun would it be for a kid to play imaginary town with his/her bed quilt? Fabrics were purchased from our local quilt shops and blocks were designed. We cut the fabrics into small pieces and provided our members with simple guidelines for piecing houses, buildings, roads, trees and mountains. 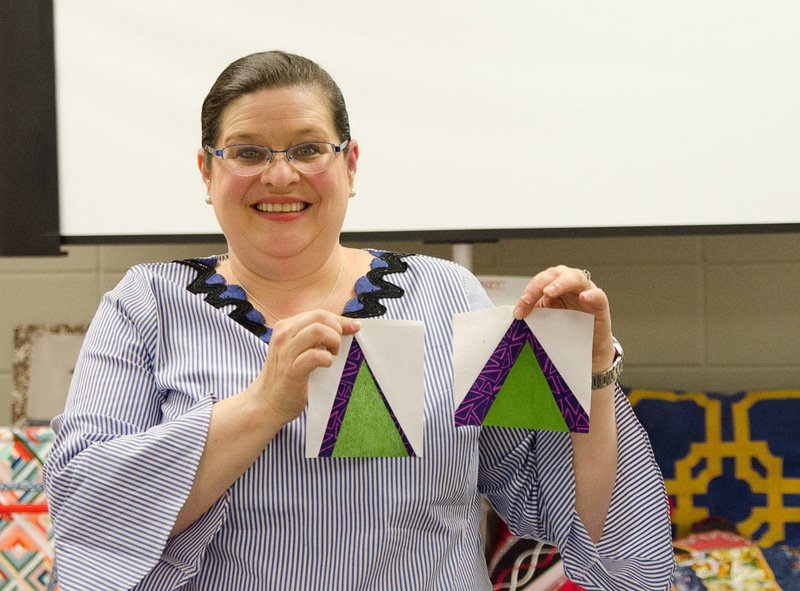 We encouraged everyone to use the patterns/guidelines to precision or improv piece all the elements we needed for our town. 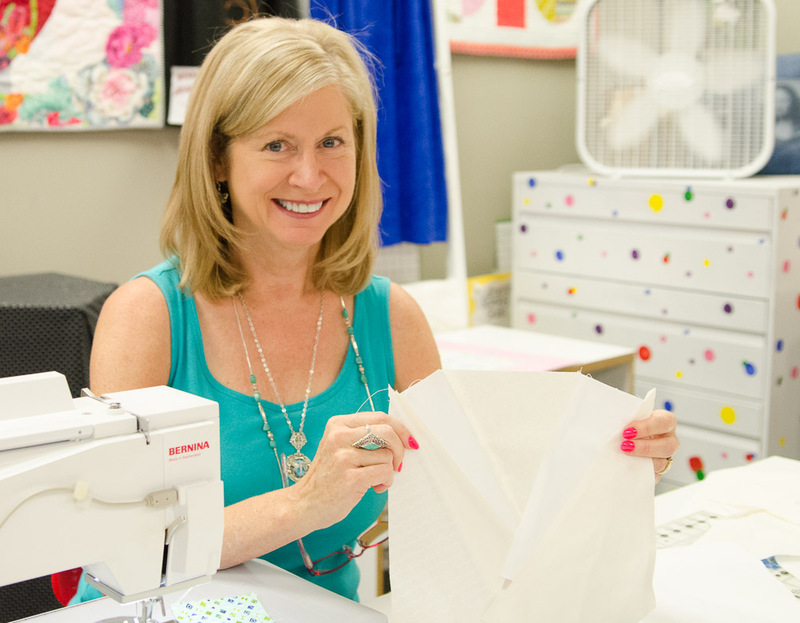 Two "sew days" were scheduled at our local shop, Bernina, We're In Stitches for community sewing. Our members busy at work! 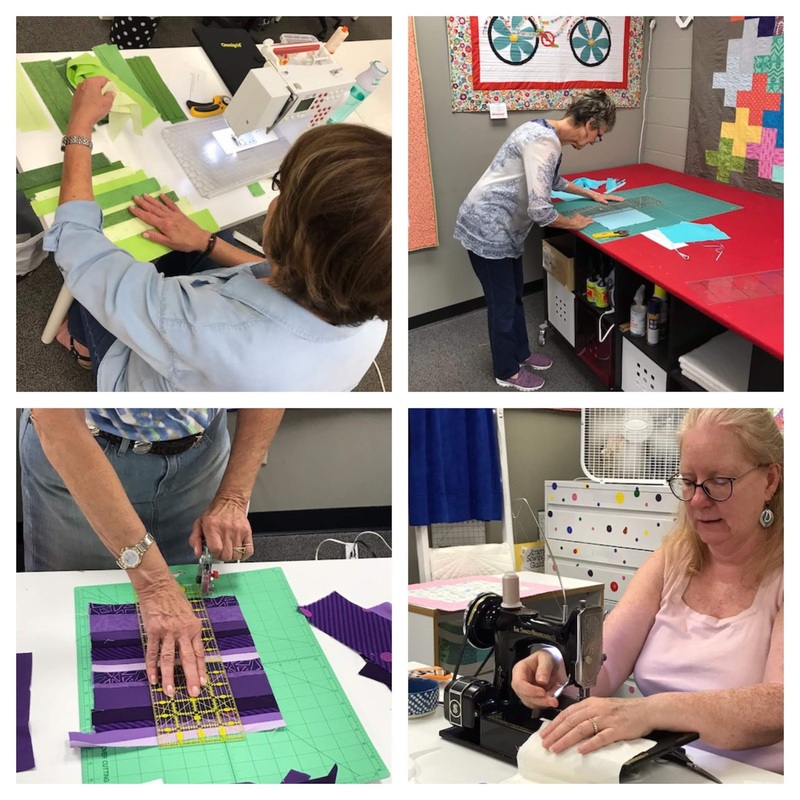 The results of our "Sew Day"
Once all the blocks and elements for the quilt were completed, our team, consisting of Paige Alexander, Didi Salvatierre, Cindy Lammon and Elise Dunbar, went to work to put them all together. 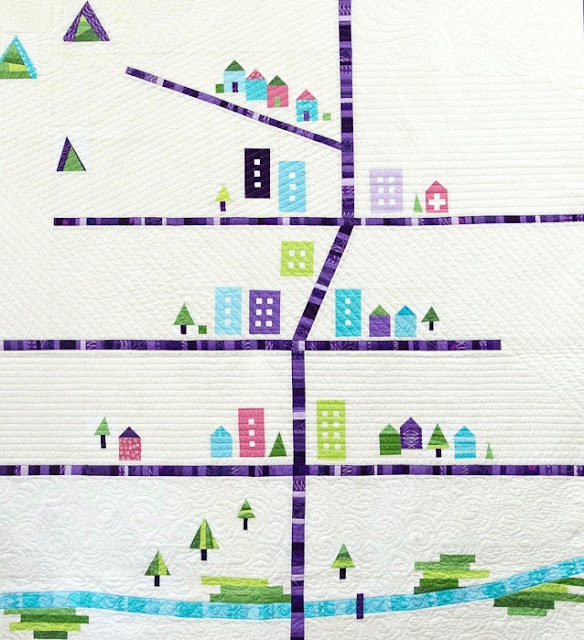 The quilt was designed from the top down, and constructed using both improvisational and precision piecing. 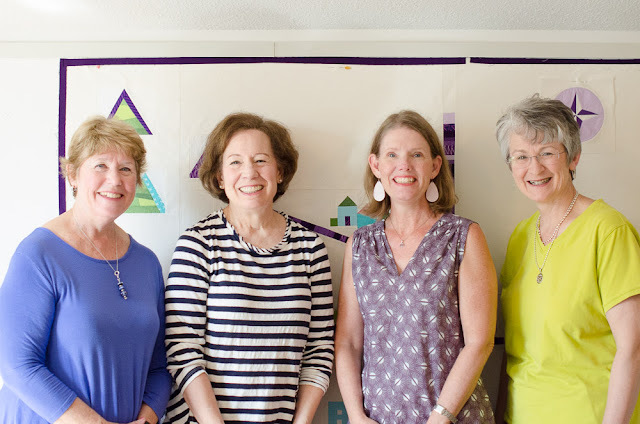 Three of our guild members, Cindy Lammon, Faye Jones and Cheryl Brickey, machine quilted the quilt using straight lines and free motion quilting. Straight lines echo the roads, large free motion swirls are featured at the top and the river/park area has smaller swirls for texture. Paige Alexander finished the quilt up by adding the binding. Be sure to notice the detail in the binding, where the blue of the river continues into the binding! Playing off the name of our city, Greenville, and the design that created roads for toy cars, we decided to name the quilt, "Zoomville". 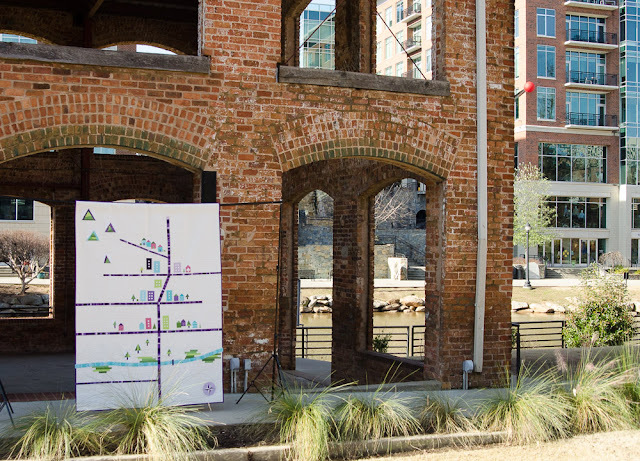 The quilt hanging in our beautiful downtown! 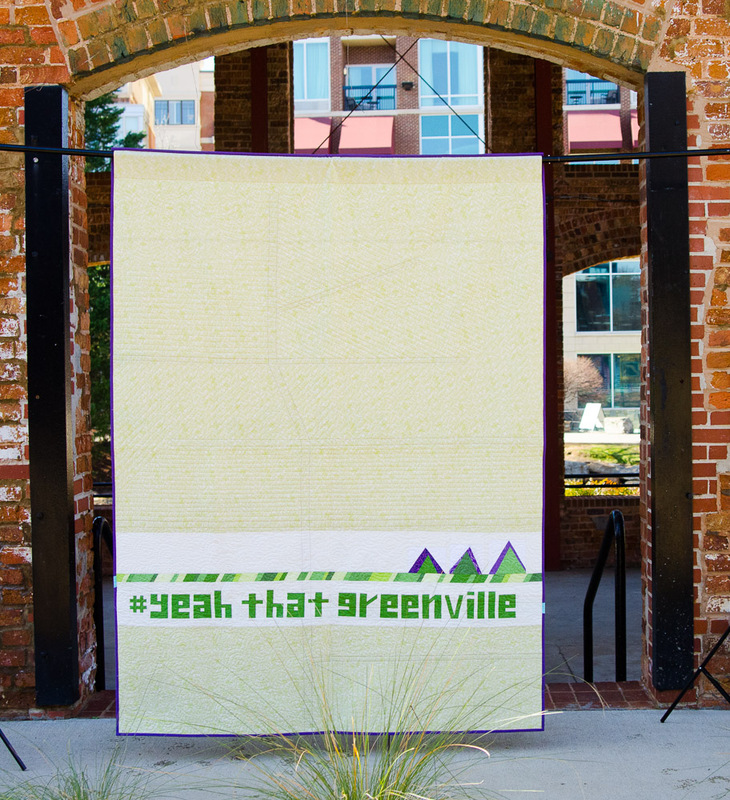 One of our city's taglines is "#Yeah That Greenville" and we chose to improv piece the letters and add it to the back of the quilt. We're super proud and happy that we took the challenge this year! 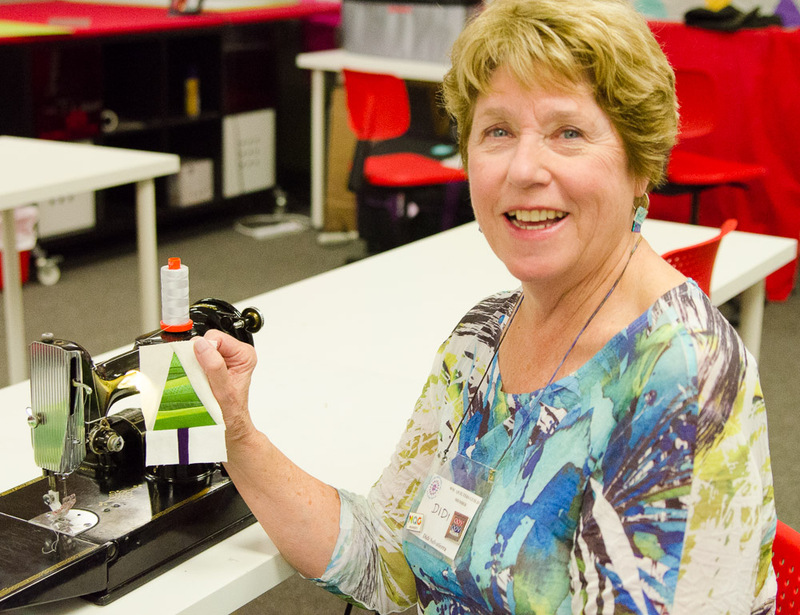 Many thanks to our members who supported the project and helped bring it to completion. 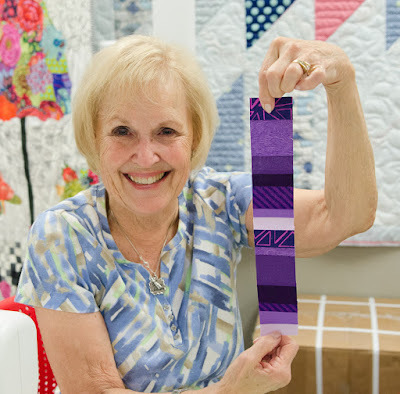 After hanging at QuiltCon in February 2019, "Zoomville" will be donated to a local children's charity.